I purchased this tool for my complete brake line replacement part of my project. I originally purchased a Sealey AK506 and it was rubbish, I had to take it back twice and eventually got a refund. I will show you the difference later in the review. Blue-Point have a strong link with Snap-On but are classed as their budget range. There is nothing that says poor quality about this tool in any way. Lesson learned, this tool was double the price of the Sealey tool, BUT, the first test flare I done was perfect, job done! This version of the tool is “Off Car”, which basically means that you do the work before the pipe is installed. There are other tools that allow you to get in close to the work area and then make the flare. I used this tool on the car as well, and it was fine. This tool is recommended for the softer metal pipes (copper and soft aluminium) and not for use with the steel pipes. The box is a plastic blow moulded design made from the quality plastic and not the cheap stuff like many other cases. The latches on the front are the clip over type and clip shut with a reassuring snap. The lid holds some limited instructions that are clear and precise on how to use the tool. 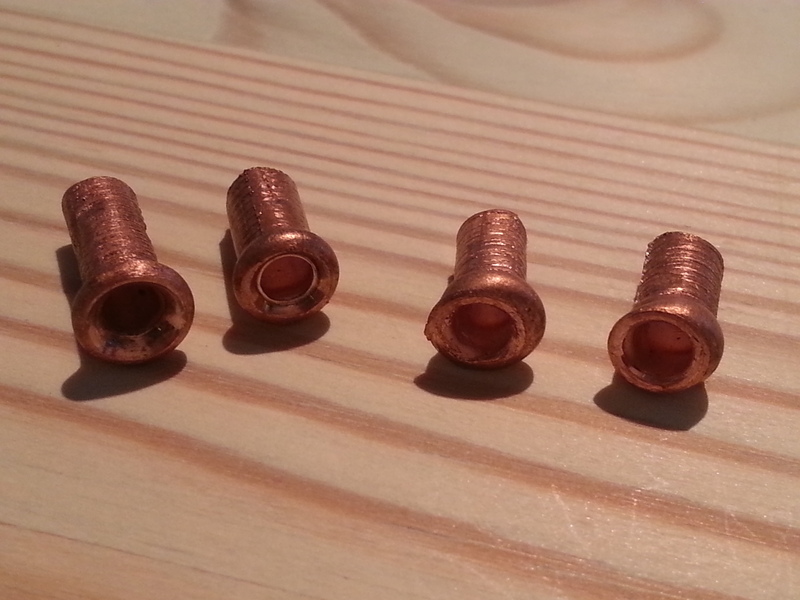 There is also a section replacement part numbers too. Not that you should ever need them. Snap-On / Blue-Point warranties some of the best in the business. Handy though if you loose a adapter. The tool is consisted of 3 main parts: The yoke assembly, a bar for the yoke, flaring bar and the various size adapters. The adapters sizes area as follows, 3/16″, 1/4″, 5/16″ 3/8″ and 1/2″. 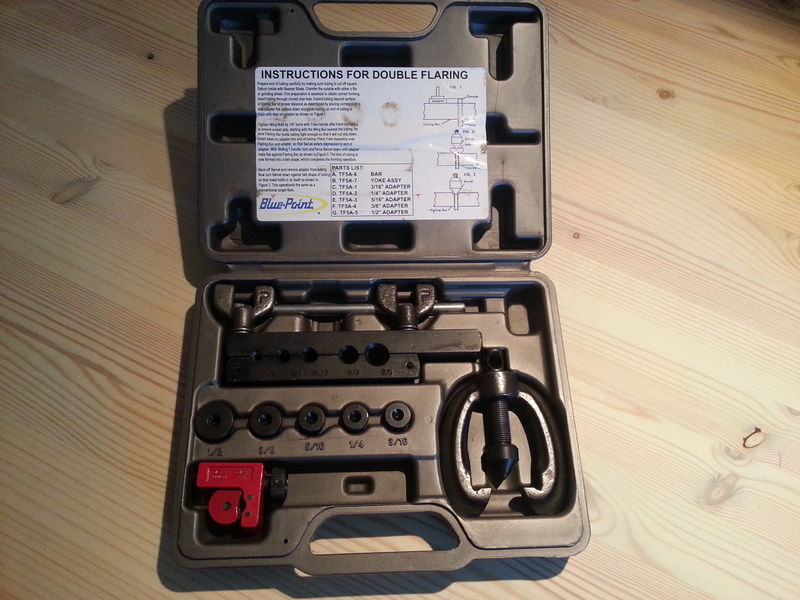 You will notice that there is a red pipe cutter in the box, this was NOT part of the kit, I picked this up for a few quid at a local DIY store. This small version fits perfectly in place as if it were just made for it. Of course I knew that when I bought it at the time! Honest guv. The coil of copper pipe I was using was a 3/16″ so I didn’t need a big cutter and this will deal with all the pipe sizes mentioned above and more. The finish of the tools is in a matt black except for the yoke and the big substantial easy to grip wing nuts that are more pewter in look. Each part of this kit is heavy and just oozes quality components. The flaring bar comes in two parts and the machined faces match up spot on, (this was an issue with the Sealey tool bar). To make the flare you insert the pipe (with the connector in place first), into the appropriate hole and clamp it to stop it moving. This next part is a critical and often overlooked; The end of the cut pipe MUST be cut square and debur the inside before trying to create the flare. If these steps are not followed the flare could fail. The pipe must be at the correct height as well, this is achieved by the base of the die, which is placed next to the pipe in order to raise or lower it as required. The faces of the flare bar have nice clear machined ridges in the jaws to hold the pipe tight and will not move when under pressure from the yoke. 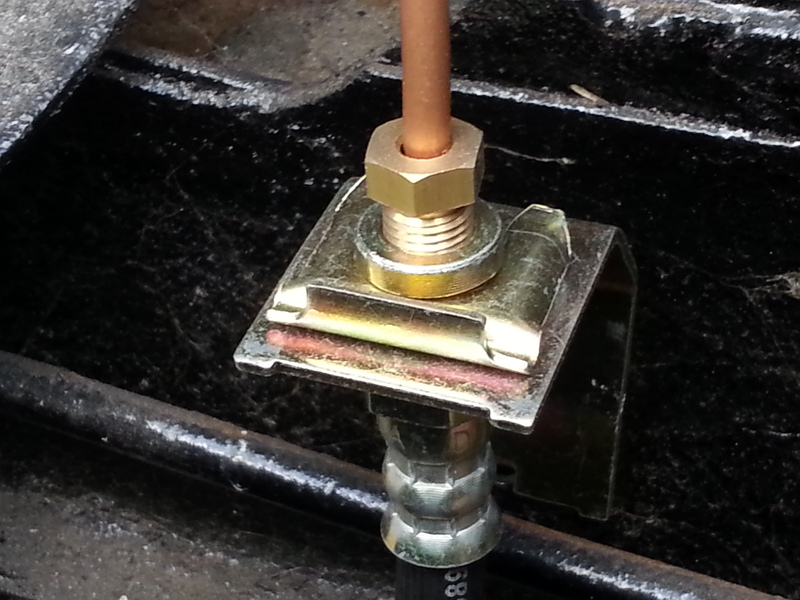 Place the yoke onto the flaring bar and insert the adapter into the pipe. Align the yoke above and wind down just untill it touches the adapter. The bottom of the yoke that winds into the adapter is a free moving part and will self level. Make sure the adapter is square on the pipe at this point. Insert the bar which has a flat at the end to stop it falling out. Wind down with a consistant pressure to start the flaring process. Depending on the flare required, double or single you may need to remove the adapter and repeat. It’s as simple as that. I mentioned earlier that the Sealey tool had issues. What happened was the faces of the flaring bar were not as good as they could be, as a result every single flare was off centre and not useable. I did about 20 test flares on a 2″ pieces of pipe to make sure my technique was good before the proper work began. If you notice the two flares on the right are from the Sealey tool, you can clearly see there is an issue with the fact the flare is off centre and uneven. The two on the left are even and clean and symmetrical all the way round. These will make a tight snug fit for the flare and above all be safe. The following picture shows the formed pipe in place for the left front flexi pipe to brake. You get what you pay for. The time and effort I wasted trying to perfect the Sealey flaring was a nightmare. I should have bought the Blue-Point tool at the outset and saved myself the hassle. Get the right tools for the right job, quality tools are worth their weight in gold. I do stainless steel lines with this and LOVE it (I hatted doing brake lines before – but I can run a whole car – front to rear in just over 2 hrs!!!! with flex lines!). Would love for you to do a review on these – great web site! Sent it to a guy doing his first car (he is 16 years old) 66 mustang coupe. I will have to consider this one the next time I´m meeting the Snap-on man.